Fromagination’s selection of artisan cheeses, delicious local food “companions,” and lovely non-food accessories make great business gifts. We provide everything from a holiday gift basket for the boss, to a lovely cheese-tasting for an important prospect, to a “Welcome” box for visiting client groups, to a unique employee retirement gift. Everything we do at Fromagination is done with an appreciation for local food, a desire to provide excellent service, and a sense of style. Our gift baskets are shipped nationwide, and our Cheese of the Month subscriptions are regularly delivered to both non-cheese-producing and cheese-producing states! Contact us at corporategifts@fromagination.com or call us at 608-665-3363 to talk about your business gift needs. Fromagination will tailor a New Employee Welcome Package (or, for example, packages for retiring or advancing employees) to fit your budget. Employee packages can include Wisconsin cheeses and treats, a map of Wisconsin cheesemakers, and a discount for Raclette lunch with friends. Fromagination can also customize a rewards program for your employees which will earn them discounts from purchase at our store or on the Fromagination website. Fromagination offers in-shop, and workplace or residential, Raclette lunches. Your friends, clients or employees can experience the fun of learning about a Swiss cultural tradition and a delicious dinner too. We can serve in your office conference room, hotel or your home. We will also arrange cheese tasting sessions for you, as a fun-and-tasty educational event for clients or employees. You can choose the types of cheese and accompanying fruits, crackers and beverages. Reward your people with a interesting, delicious event! Fromagination offers a variety of gift baskets – in size, price and contents – for holiday presents, business clients or employee rewards. We also create made-to-order baskets for special occasions! Some baskets showcase Wisconsin artisan foods – with focus on wonderful cheeses. Others make delightful Valentine’s Day, Christmas or Thanksgiving gifts for your clients or new business prospects. 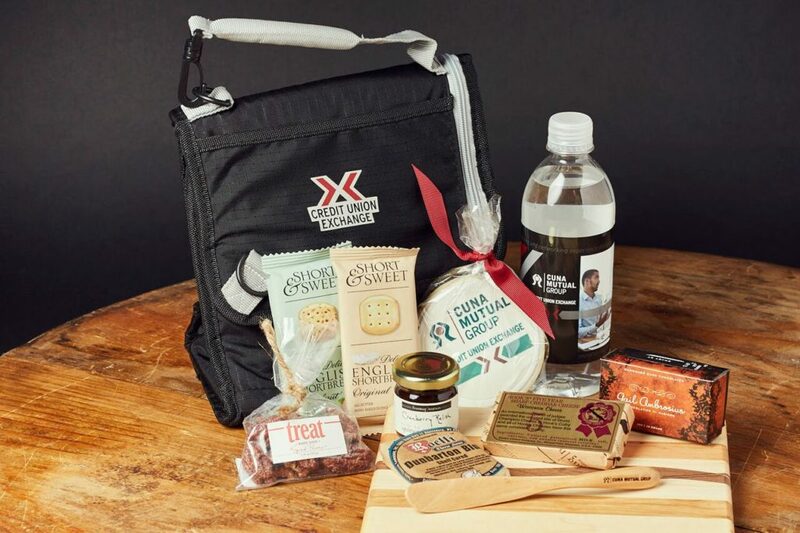 We will also customize gift items with your company name and logo, such as cheese boards and lunch totes. Provide your visitors with a delicious gift of Wisconsin artisanal cheese at their hotel or bed-and-breakfast. Fromagination has a variety of hospitality gifts to welcome corporate visitors, wedding parties or conference attendees. Let us create a lovely “Wisconsin welcome” that includes a tie to America’s Dairyland and its tasty heritage.